These stories are disturbing. They sizzle like hydrogen peroxide on an open wound. 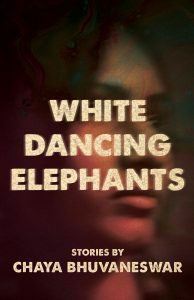 They unpack “Other” to a depth never explored before in the American short story (“Others,” as in what Ashis Nandy says, “What others can do to you, you can do to your own.”) In Chaya Bhuvaneswar’s White Dancing Elephants, a psychiatric patient destroys her doctor, a father considers murdering his disabled daughter, a taxi-driver-turned-poet disappoints his family, and a manicurist embezzles her criminal employer’s money. And that’s not the half of it. She is a master of the twisty narrative and the unexpected reveal. Indian cultural concepts are a consistent presence in her stories: Saraswati, the Hindu goddess of knowledge, music, and art. (95). Kali, the complicated goddess of time, creation, and death (75). Ashis Nandy, one of the “most formidable and controversial intellectual[s]” of our time, author of The Intimate Enemy (153). In her depiction of transgression as a core locus of Otherness, Bhuvaneswar writes about motherhood, fidelity, class privilege, patriarchy, lesbian love, celebrity culture, and politics. We read about Rachel Ray and Jay Z (146). We get some Bobby Jindal. 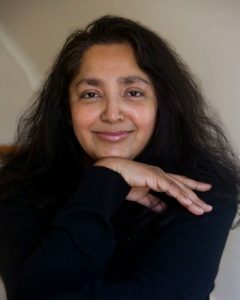 “Sylvia had read about the Christian-converted Indian-American Southern white man while sitting in her mother’s warm kitchen at home…” (55). For the seventeen stories in this collection, Bhuvaneswar won the Dzanc Short Story Collection Prize. Fourteen of them were previously published in such venues as Asian American Literary Review and Michigan Quarterly Review. All seventeen of these stories are remarkable.